The Annual Meeting of the Muirfield Association, Inc. will be held Wednesday, April 19, 2017, 7:00 p.m., at The Country Club at Muirfield Village, 8715 Muirfield Drive, Dublin, Ohio 43017. Pre-meeting social time begins at 6:30 pm with complimentary appetizers and a cash bar. The Board of Directors will be available before the meeting. Please introduce yourself and let them know of questions you may want to discuss during the New Business portion of the meeting. The regular business meeting will start promptly at 7:00 p.m.
Coming soon: Annual meeting materials, including voting ballots! Please watch for an eNews alert letting you know when materials will be available online. For those on paper communications, expect your materials in the mail in early April. The Muirfins Swim Team season is right around the corner! The Muirfins Swim Team is the community swim team for families who live in Muirfield Village. Our mission is to get Muirfield kids off the couch or screen they are glued to and outside for some good, healthy summer fun and competition! We accept kids ages 5 - 18 (as long as the child can swim one length of the pool unassisted). There are no try-outs - we will work with all levels of swimmers. Sign-ups are on-line at www.muirfins.com starting April 10th. There will be a parent/swim suit sizing meeting on April 10th at 6:30 at Grizzell Middle School in the Lunch room with a new parent info session at 7pm. Board Members and coaches will be available for questions and team swim suits will be available for sizing and ordering. Get more information about the Muirfins Swim Team, see photos, view the team schedule, and learn how you can join in the fun at www.muirfins.com. If you have questions or need more information, email Muirfins President Amy Weeks at [email protected]. Muirfield Association is pleased to pass on the following two announcements from The Country Club at Muirfield Village. The Country Club at Muirfield Village invites the residents of Muirfield Village to attend an Open House event to discover the excellence of the family-friend country club. Open House attendees will receive a tour of the club’s exceptional amenities as well as information regarding various golf and social membership opportunities. Interested attendees should RSVP to Alissa Klein at [email protected] or (614) 764-1714 ext. 116. 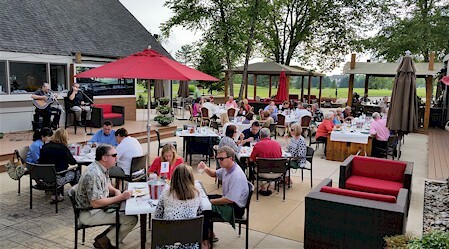 The Country Club at Muirfield Village (TCCMV) and Muirfield Village resident Dale Darnell are proud to announce their partnership in establishing the first Muirfield Village Pelotonia team! The team will participate in Pelotonia’s three-day experience (August 4–August 6) that includes a weekend of cycling, entertainment and volunteerism in honor of two Muirfield Village residents, Skip Juris and Patricia Taylor, who recently lost their battles with cancer, as well as the many other past, president and future cancer patients and survivors. Dale and TCCMV invite all Muirfield Village residents to join their team as a rider, a volunteer or a contributor to help fight back against cancer and to raise funds for James Cancer Hospital and Solove Research Institute. Interested participants may contact Dale at [email protected]. About Pelotonia: Founded in 2008, Pelotonia was established with the objective to fund life-saving cancer research. Pelotonia is a three-day experience that includes a weekend of cycling, entertainment and volunteerism. Through its first eight rides, Pelotonia raised more than $130 million for cancer research. Thanks to its generous funding partners, Huntington Bank, L Brands Foundation, Peggy and Richard Santulli, American Electric Power Foundation, Nationwide Insurance, Cardinal Health Foundation, Harold C. Schott Foundation, Pelotonia is able to direct 100 percent of every rider-raised dollar to cancer research at The Ohio State University Comprehensive Cancer Center – James Cancer Hospital and Solove Research Institute.To learn more about Pelotonia, visit http://pelotonia.org/. Want all of this information in one place? Download the 2017 Tennis Activities sheet or the 2017 Swim Activities sheet. Did you know all Muirfield activities can be found online anytime on our calendar? Find activity listings for the Garden Club, MVCA, Bridge Club, swimming, tennis, and more!